Firstly: an apology. When I started this blog, I fully intended to write an entry at least once a week. And, for a while, I kept to my targets (sort of). But in spite of the best intentions, life often has a habit of getting in the way. And in my spare time I have been hard at work writing a novel. The novel is now provisionally finished which thankfully leaves more time for writing this blog. And there's nothing like a new year to stiffen the resolve and to promise yourself (and anyone else who will listen) that this time round things will be different. So without further ado, it is my esteemed pleasure to introduce the Moor to Coast blog for 2012. It might not be bigger, bolder or brighter than last year's but hopefully it will be more regular. It seems unseasonably warm for the time of year. You wouldn't think it was January. Once you start walking it's almost t-shirt weather. But we choose to keep our jackets on; both knowing that it won't be long before we get sidetracked. Barely a hundred yards from the car park just above Noss Marina and it's fungi time. 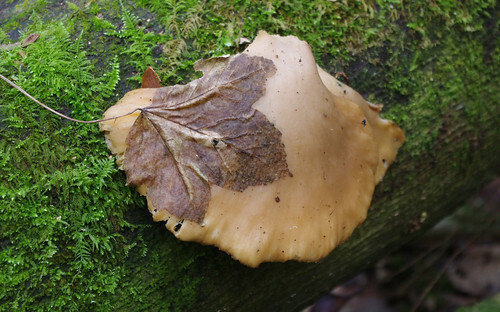 Noss Plantation (as it's named on the OS map) is full of the recent casualties; the felled and the fallen. The fungi have soon made the trunks and stumps their home. 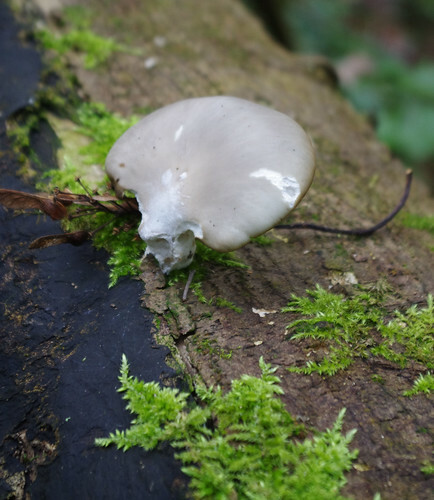 The oyster mushroom photographs in my field guide are all gregarious. This specimen looks quite lonely on its own - unless of course I have identified the wrong species. Within sight of this fallen trunk, we soon found another. This specimen was also alone but who knows what might be going on under the surface that we can't see? I've always wondered what it would feel like to be able to go underground and see the phenomenon of spreading mycelium roots in a time-lapse photography sort of way. After a good twenty minutes exploring the different fungi in Noss Plantation we found our way back to the main path, crossed the main road and continued along the Private Drive that leads to Hoodown. Hoodown is a mixed woodland owned and managed by the National Trust. 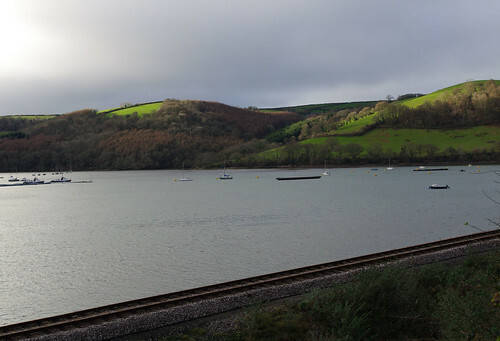 On the right side it banks steeply down towards the South Devon Railway Line and the River Dart and on the left, the land slopes just as steeply upward. 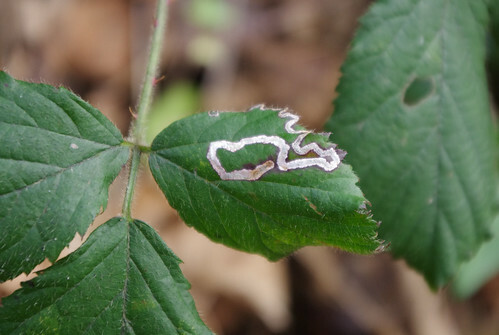 We often see these strange markings on bramble leaves. They are made by the caterpillar of a micro-moth that crawls around inside the leaf making patterns. I would love to be in the right place at the right time later in the year and see one actually emerge! The trail made by the caterpillar follows the ribs of the leaf in places before veering off at the edges. Sherry put the 18-55 kit lens on the camera today. We very rarely use this lens. For macro shots the focus is not as pin-sharp and the bokeh not as pleasing as the 100mm macro lens but for landscapes the kit lens is capable of producing impressive results. As we left Hoodown Wood behind and walked along the road towards Kingswear, Sherry kept a keen look-out for the ideal landscape shot. 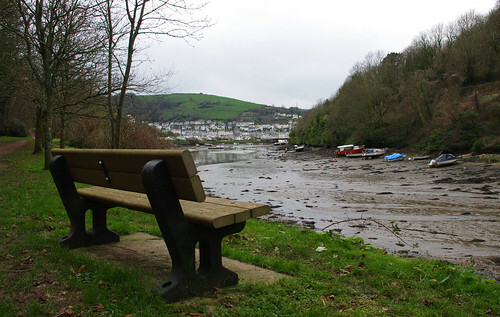 Bench with a view of Dartmouth in the background. There was also an egret fishing at low tide for tasty fishy titbits. Watching these graceful birds is always a pleasure. They tread so delicately through the mud so as not to disturb their potential prey. Going back twenty years or more I only ever used to see them occasionally but they are quite common now in South Devon. 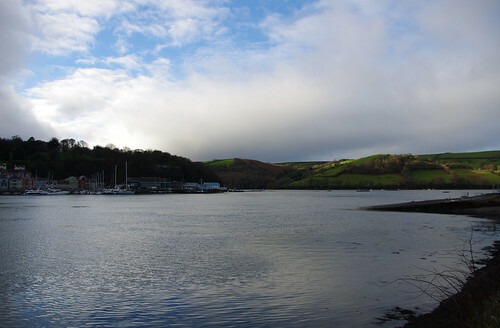 We took the path to the left of the shot and its end continued along a redirected footpath through Dart Marina. At first it did not seem like there was a path and that we would get lost weaving in and out of the boats but we found it and at the end crossed the railway line and walked along the path adjacent to it. 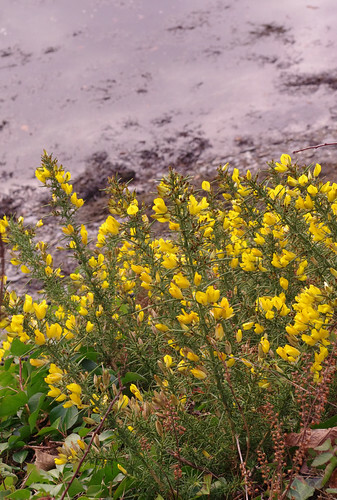 The flower above could possibly be a hybrid of two different Gorse species: Ulex europaeus and Ulex gallii. But it was growing on the gravel bank. I was reluctant to get too close and slip to a watery exit. There were a large variety of plants growing on the gravel beside the railway or nearer to the river (including a type of cabbage) and I tried in vain to distinguish many of the leaves. One of the advantages of coming to places such as these (literally on your doorstep) is that you can return throughout the year to see how the plants you don't know develop. In a couple of months time, when the flowers start to appear, I might be able to tell them apart but at the moment I'm severely out of practice. Sherry has an uncanny knack for picking out shots I would not even consider when looking through the viewfinder. I have to confess I did not think much of this shot initially but it repays a second look. One thing I did notice when reviewing shots on the computer is that with the kit lens the camera tends to produce results slightly darker than they actually looked (even though it indicates a spot-on exposure right in the middle.) Having said that, it was an overcast January afternoon. As we approached the Higher Ferry crossing point, we slowed our pace, hoping the light would improve. And for a precious few magical moments, the light did improve and the sky turned from glum-grey to glorious blue. From here we left the path and railway line behind and walked back up through Hoodown Wood and Noss Plantation. Perhaps the kit lens should not be left at home so often. Or better still: perhaps we can save up for a proper landscape lens. Now: where did I put those pennies?